Once upon a time, (as all good fairy stories begin), Tollesbury was served by a railway. This was at the end of a branch line off the main route to East Anglia from London (Liverpool Street). 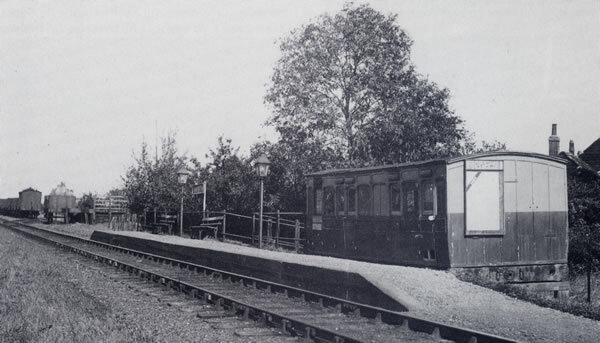 However, whereas fairy tales have no truth in them, the Kelvedon and Tollesbury Light Railway was a historical fact. 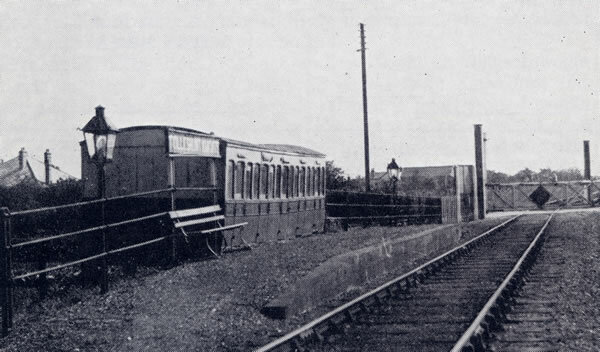 Whilst the whole of the route from Kelvedon to the Tollesbury terminus is of interest to the real enthusiast, it is 'our' end of the line upon which it seems most appropriate to concentrate for the purposes of this Web-site. However, in writing about the rise and fall of the 'Crab and Winkle' as the line was affectionately called, a certain amount of general background must also be supplied. 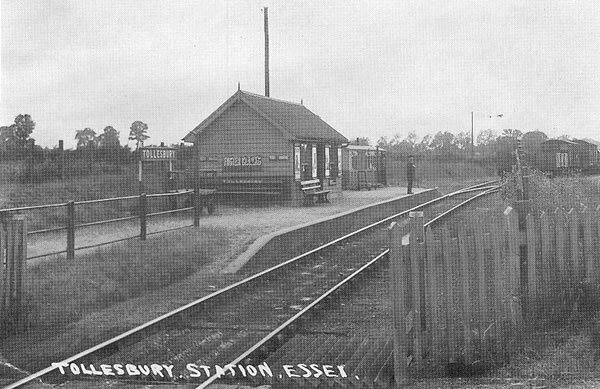 At the time of the passing of the Light Railways Act in 1896, the part of Essex in which Tollesbury is situated was still very remote. Even today the road system leaves a lot to be desired, but in those days there is little doubt that even on the 'main' roads locally, travelling was precarious.They were days when in many areas the railways reigned supreme, and the mooted railway from Kelvedon to Tollesbury soon after the passing of the Act was anticipated to enable the region to share in the benefits afforded by the steam locomotive. 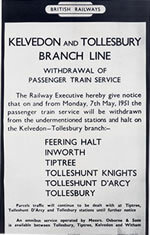 After the inception of the idea at that time by Sir William Abdy, who was Lord of Barn Hall in Tolleshunt Knights, and much administrative work in the intervening years, the final stage in this aspect of the history of the line was its authorisation under a Light Railway Order of 29th January 1901. A small ceremony, attended by about six people at Feering on 11th November 1902, marked the cutting of the first sod. The main civil engineering works involved the excavation of 50000 yards of earth to construct a cutting, and the movement of this earth to other parts of the line where embankments had to be constructed. The only bridge on the route was constructed in brick at Blind Lane, Tolleshunt Knights. The winter of 1903 was exceptionally wet and work on the line was delayed for more than two months. The opening had been scheduled for the summer of 1904 but this likewise was delayed and eventually took place in steady rain, with no formal ceremonies on 1st October of that year. One hundred and twenty guests made the first run to Tollesbury, the train leaving its Kelvedon terminus at about 11.00am and, on its arrival at Tollesbury, 8 miles to the south-east, was greeted by an enthusiastic crowd of sightseers. The weather began to improve and the guests walked the route from Tollesbury station down to the River Blackwater, following the course of the half-finished extension to Tollesbury Pier. The only building in the village decorated with bunting was the King's Head, to which the party adjourned in the sunshine for a celebratory meal. Most of them returned on the afternoon train. Later, many Tollesbury villagers, because of the more clement weather, decided to take the evening train to Tiptree. Access at the Kelvedon terminus to this novel line was by a footway running across the road bridge and descent to the Low Level Station. 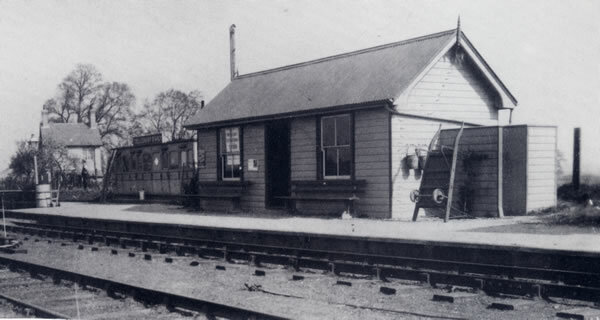 Passengers waited here for their train in a small wooden shed to the intermediate stations and halts on the line - at Feering, Inworth, Tiptree, Tolleshunt Knights and Tolleshunt D'Arcy, before reaching Tollesbury and finally Tollesbury Pier. The route gently meandered through the Essex countryside, the maximum gradient being 1 in 50 feet. 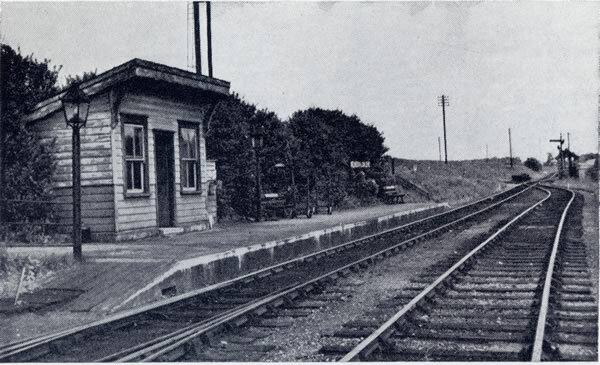 Greatest curves occurred on the final section between Tolleshunt D'Arcy and Tollesbury and included an agricultural siding at Old Hall. 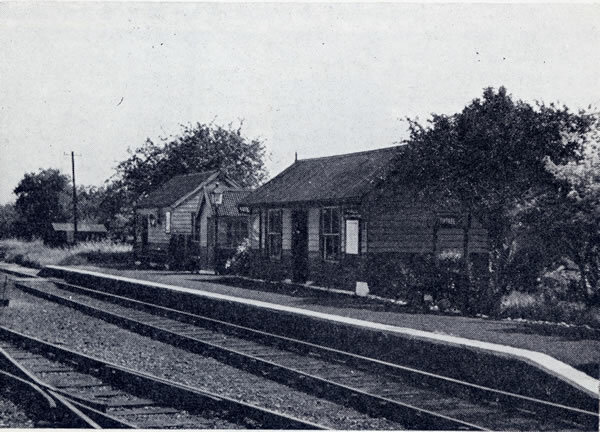 The stations at Tiptree and Tollesbury were the most attractive on the line. The latter consisted of a small goods yard, complete with loading gauge and cart road and wooden buildings. 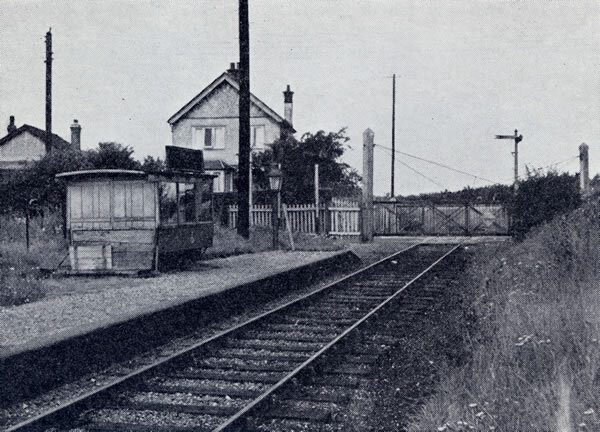 The line then crossed the road, Station Road, by an open crossing on the other side of which was a run-round loop. The extension to the pier remained open for less than 20 years and skirted the village before dropping steadily to the Blackwater. Two roads, Woodrolfe Road and Woodrolfe Farm Lane were crossed by this final section of the line. 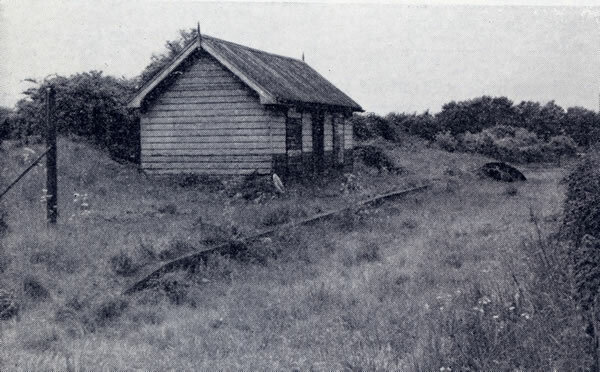 The terminus at the pier consisted of an old coach body and a red brick hut about 40 yards from where the pier began. This extension was completed 2 years after the major part of the route, on 15th May 1907. It provoked much interest from local people, particularly because the promoters had plans for development of land here with bungalows and houses, and a yacht station nearby. The area was to become a continental packet station and a weekend yachting resort. High ideas indeed! All these high ideas unfortunately were to come to nothing, and in 1939 the pier extension, which had only remained open until 1921, was taken over by the then War Department. Part of the structure was blown up in 1940 as an anti-invasion precaution. The overgrown track was terminated in a sand-drag and used by four locomotives to service the mobile guns that were stationed along the estuary. Part of the extension had been used previously for the storage of rolling stock, but the wooden pier had been allowed to fall into disrepair after closure nineteen years earlier. Two buildings were erected near the line during the war as part of the anti-invasion precautions strung along the Blackwater estuary. One, a pill-box of thick reinforced concrete was built on the land end of the pier. The other, a control tower for the many electrically controlled mines, which effectively blockaded the estuary against enemy attack, was built about mile inland on the seaward side of the line. The old pier was finally demolished when the line was taken up in 1951, and any traces that might have been left were washed away when the great floods of February 1953 inundated the north bank of the Blackwater for about mile inland. Today, even the few rotting stumps of timber which stood above the mud at low tide have disappeared. As with most light railways, services were neither rapid nor very frequent. A majority of the trains were mixed and the time allowed for the journey was between 30 and 40 minutes. No trains ran on Sundays. By rail Tollesbury was only about 49 miles from Liverpool Street but that journey would probably take in excess of 2 hours. When constructed, and with the developers' dreams for the Pier area, the line was expected to play a very important role in the life of the local community. So it did for a while and in the early years daily traffic was peaking at 1000 journeys. However, the 1914-1918 War put paid to the schemes of the developers, schemes which had in any case been rather optimistic because of the vast areas of salt-marsh, and further problems were also being experienced by the L&NER in the form of competition from a parallel bus service. By 1937 branch traffic was in steady decline. Ten years later passenger journeys had reached their lowest ebb - averaging only 33 return journeys along the entire route each day. In 1948 the London and North Eastern Railway became part of the nationalised British Railways. Appreciative of the amount of revenue being lost, the new governing body submitted plans within two years for partial closure of the line. 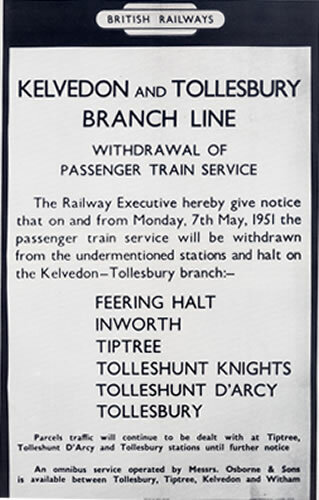 The acceptance of these plans with little opposition saw the eventual withdrawal of passenger services along its entire length on Saturday 5th May 1951. Freight traffic continued until 29th October of that year after which date such traffic operated only between Kelvedon and Tudwick Road siding at Tiptree. On that Saturday in May, over 400 people gathered at Kelvedon, all eager to make the return journey on the last train on the 'Crab and Winkle'. The engine, number 68578 was beautifully turned out and, with its three coaches, decorated with streamers. Maldon MP of the time, Tom Driberg rode on the footplate as honorary fireman. The train left Kelvedon amidst the sound of fog detonators, football rattles and cheers. More people crowded on at the intermediate stops until over 430 were on board when it reached Tollesbury. On the engine's firebox were chalked 'Born 1904. Died 1951', and on the bunker was the solemn warning, 'There be many a poor soul have to walk'. This last train to Tollesbury arrived on time at 6.25pm, and on departure for the last time to Kelvedon was accompanied by as much noise as the departure on the outward journey. The ill-fated Tollesbury Pier extension had been the first to disappear. This was followed after the final train on the Tollesbury section 29th October by the lifting of the track to a point 200 yards east of the Tiptree (Tudwick Road) siding. Land formerly owned by the railway was offered at a nominal price to adjoining landowners - most of them accepting. The final movement on any part of the line was on 28th September 1962 when the last freight train left Tiptree behind a diesel shunter locomotive. Thus the 'Crab and Winkle' finally became a feature of the past. The line went the way so many branch lines and especially light railways were to go in the future..but somehow, perhaps, the ghost of the little old railway was never going to be allowed to die! Written by Rev. Keith Lovell Copyright © 1999.